A breccia is a clastic sedimentary rock composed of angular clasts in a consolidated matrix. 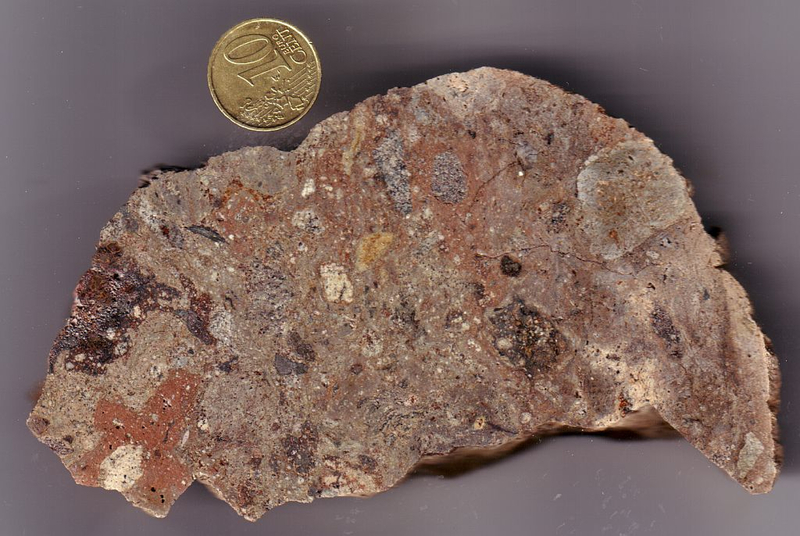 Breccias can be produced in several geologic processes: tectonic breccia, volcanic breccia (eruption breccia, vent breccia), sedimentary breccia (e.g., rock fall breccia), collapse breccia (e.g., in karst areas). Depending on the origin of the clasts, monomictic (monogenetic, monolithologic) and polymictic (polygenetic, polylithologic, Fig. 1) breccias may be distinguished. Fig. 1. Wanapitei (Canada) polymictic impact breccia. 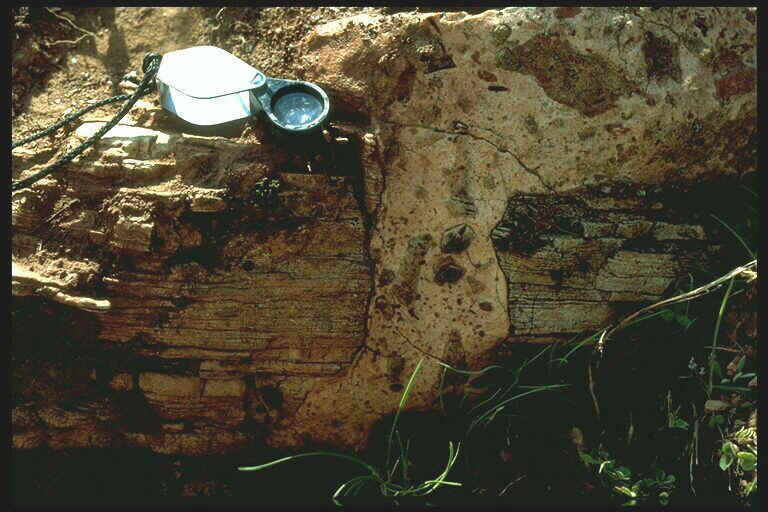 In impact structures, monomictic and polymictic breccias are one of the most prominent macroscopic features (Figs. 2 – 4). There are many phases in the cratering process when they can be formed: in the rock mass flow behind the shock front starting from the impact point, during the excavation and the formation of the so-called transient crater (Grieve et al. 1981, Melosh 1989), during the ejection of the excavated material, on landing of the ejecta and their emplacement and mixing with local material (ballistic erosion and sedimentation; Oberbeck, 1975), and during the collapse of the transient cavity in the modification stage (Melosh, 1989). In this complex process, breccias may incorporate earlier formed breccias, which leads to breccias-within-breccias and even to multiple breccia generations generally unknown from other geological processes. Fig. 2. Massive impact breccia layer (“Bunte breccia” ejecta) overlaying autochthonous Malmian limestone exhibiting prominent striations due to high-pressure emplacement of the ejecta. 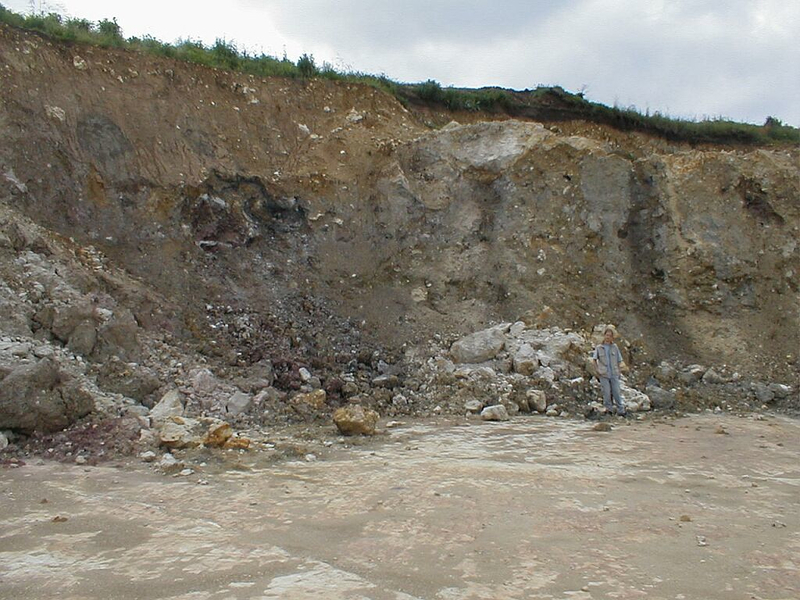 ; Ries (Germany) impact structure, Gundelsheim quarry. Fig. 3. 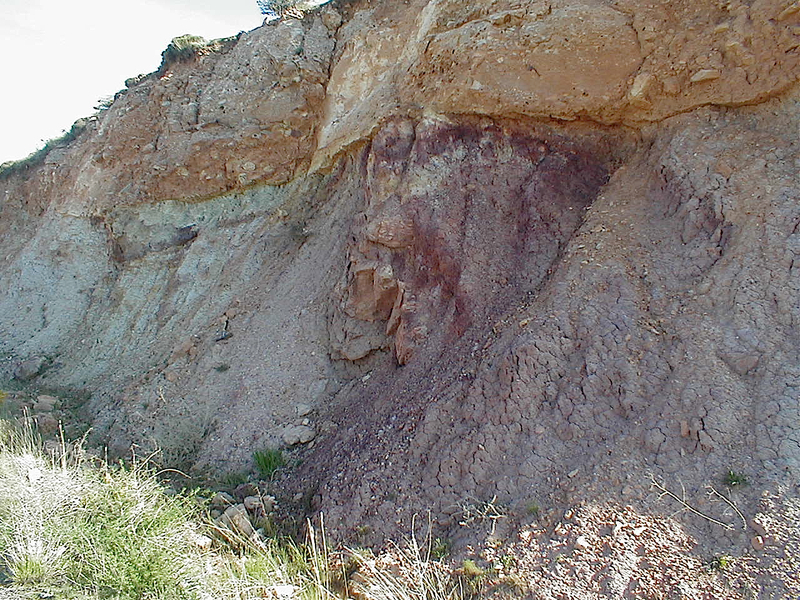 Massive suevite breccia layer erosively cutting Cretaceous sediments (Utrillas Formation); Rubielos de la Cérida impact basin; near Fuentes Calientes. Fig. 4. 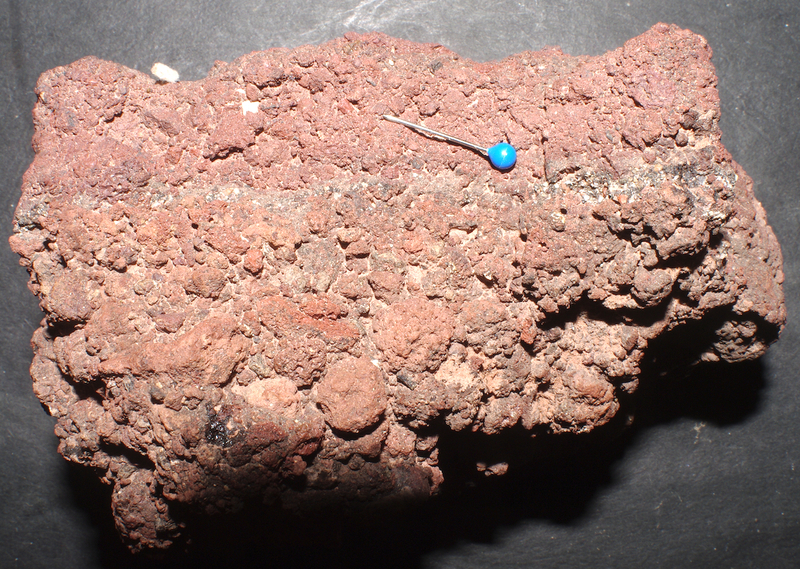 Weakly cemented impact breccia from the Meteor Crater (Barringer Crater), Arizona. Impact breccias can be observed on megascopic (megabreccia), macroscopic and microscopic scales, and they abundantly occur in the form of dikes. Dikes in the common geological sense are mostly tabular bodies of different materials (minerals, rocks, ores) cross-cutting the host rock. In impact structures, breccia dikes have played an important role in the understanding of the impact cratering process. They have been reported from many impact structures, and they have in detail been investigated e.g. for the Rochechouart (France) and Azuara (Spain) structures. It is generally suggested that for the most part the breccia dikes are formed in the excavation stage by injection of brecciated material into the walls and the floor of the expanding excavation cavity. Later formations of breccia dikes in the modification stage incorporating earlier formed ones may lead to generations of breccia dikes. Fig. 5. Impact breccia dike sharply cutting through well-bedded Muschelkalk dolostone. Rubielos de la Cérida (Spain) impact basin, near Olalla.